An account of a family caught, with tens of thousands of strangers, in the Thailand tsunami of 2004. 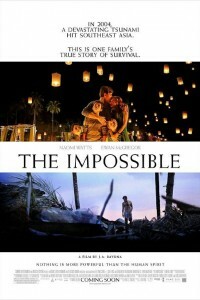 Based on a true story, The Impossible is the account of a family caught, with tens of thousands of strangers, in the mayhem of one of the worst natural catastrophes in human memory. But the true-life terror is tempered by the unexpected displays of compassion, courage and simple kindness that Maria and her family encounter during the darkest hours of their lives. Both epic and intimate, devastating and uplifting, The Impossible is a journey to the core of the human heart. Why it most likely will bomb? Audiences like to see disaster movies that are fictitious, not that are based on true stories; as is evidenced by the myriad 9/11 movies that were released just a few years after the tragedy. Why it may find a cult following? It’s from the director of the 2007 sleeper, The Orphanage, from Spain, (yet, The Orphanage was the only movie the director made before The Impossible. A five year span between movies in Hollywood – for a first time director – is a death sentence). In the movie Shut In, a woman (Naomi Watts) discovers a terrifying secret about her troubled son. .